Donna Richardson Robbins was the subject of a feature article in the Press Democrat: "Father’s Stewart’s Point memories preserved in new book"
Read the book review in Northbay Biz -- Tractors, Trains & Shipwrecks is one of their "December Picks" (scoll down page to second article). As Bodega Bay no longer has a newspaper, READ the feature article on BodegaBay.com (placed in their Travel Tips section). Donna Richardson Robbins was interviewed for "A Novel Idea" on KRCB radio (PBS) Sunday, October 30th. Listen...(hers was the second segment on the show, you can advance the MP3 to begin at 37:50). Donna Richardson Robbins was interviewed for an hour-long segment on on 12/15 on "Peggy's Place" on KGUA-FM. "Tradition Survives at Remote Outpost Dynasty: The Richardson family has owned and operated the general store in a Sonoma County hamlet since it was built in 1868." 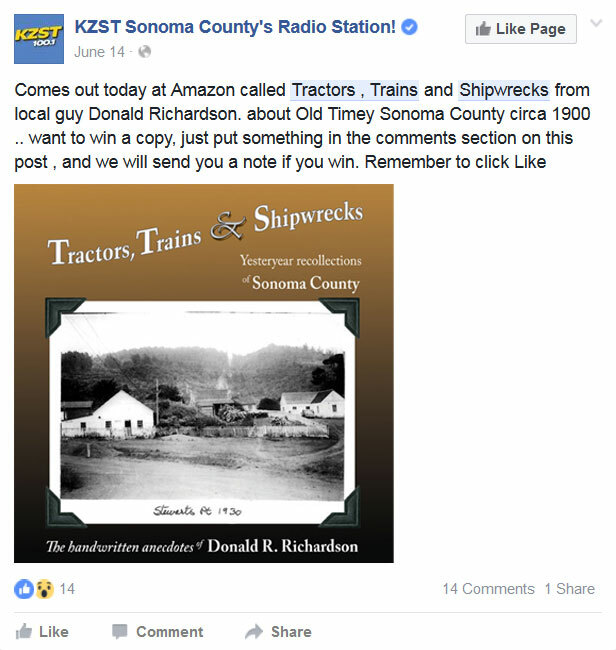 Tractors, Trains & Shipwrecks....in the news! Copyright © 2016 - 2018, DRR Press. All rights reserved. Site designed by Renaissance Consultations.